In lieu of a party for Hannah's birthday this year, we decided to take her to see Disney on Ice that came through this week. Mamaw and Grandad thought this was a great idea as they had already decided to give Hannah tickets for her birthday. We had a blast! Hannah talked about seeing "Mickey's Show" all weekend! She even told her teacher at school as soon as we got there Monday morning! Hannah in her birthday tutu! Hannah's favorite movie right now is Princess and the Frog. We watch it at least once a day. She was excited to see Princess Tiana, as well as the other princesses. Cracking up with Uncle Jonathan on the way home! This morning, we took some of Hannah's birthday money and bought Zoo membership for the year. Hannah loves animals right now, especially the elephants. We love the idea of birthday gifts that allow us to spend time together rather than another toy to clutter her room! Hannah is all girl! She loves to mimic Mama getting ready and insisted that she have "prippy" (pretty) toes before we left! Checking out the gorillas with Daddy. And of course, the favorite elephants! Five years ago, I married the love of my life! It has been a wonderful 5 years, with every year better than the last! 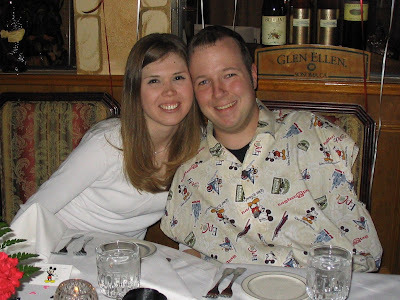 Happy Anniversary, Chet! ...neighborhood driveways and sidewalks become very colorful! ...this sweet little bundle came into our lives. Now she is two! It is so hard to believe that two years have gone by so quickly. She was quite the princess on her birthday. 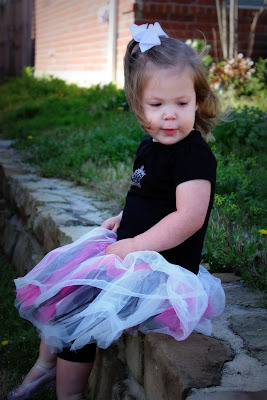 She loves dressing up so I made her a tutu and princess shirt to wear on her special day. She has wanted to wear it all week! We were actually in Texarkana yesterday on her birthday for a speaking engagement at a youth group conference. They found out it was her birthday and threw her a small birthday party at lunch complete with a very cute cupcake shaped like a dog and presents. Hannah loved being the center of attention! We were so amazed that they would do all of that for our girl, even though we had just met. It is a great testimony for the love that the family of God shares across the world! After such an exciting day, we sent Dad back to church to speak one more time. Hannah finished out her being princess for the day watching a Disney princess movie, Snow White, popping popcorn (her first taste) and just having some fun girl time! We decided to not do a big party this year, but to take her to the Disney On Ice show coming to Dallas at the end of the month. We'll share more on that later! ...gave one last kiss to the mouse. ...had dinner with Mickey, Pluto, Chip and Dale at our favorite restaurant. ...couldn't be happier watching priceless moments. ...had a blast walking through the larger than life toys in the queue for Toy Story Mania. ...had fun hanging out with Micah! ...fell asleep on our way to the Magic Kingdom. ...and was so excited to be riding, "it's a small world" again! ...gave a kiss to Minnie Mouse. ...showed our shoes to Donald Duck. ...decided she needed to get some new shoes. ...had some fun with some great friends. ...tried unsuccessfully to get two toddlers to stay still long enough at the same time to take a picture. went on a safari to see Hannah's favorite animal, the elephants! ...cheered up grumpy Eeyore with a hug. ...shared some love with Tigger. ...and strolled the Boardwalk with Daddy. I know I skipped a day, but my camera didn't come out much on the first day. So as promised, pictures from Disney World! We had a blast and loved getting to spend time with our Tennessee friends, the Fromans, who love Disney as much as we do. ...had breakfast with Mickey and friends. I think these faces say it all! ...got a kiss from Pluto. ...met up with our favorite bear. ...learned that monsters like to "fist pound" it, too. ...rocked out with our Playhouse Disney friends. ...and beat Daddy in a wild game of Toy Story Midway Mania!